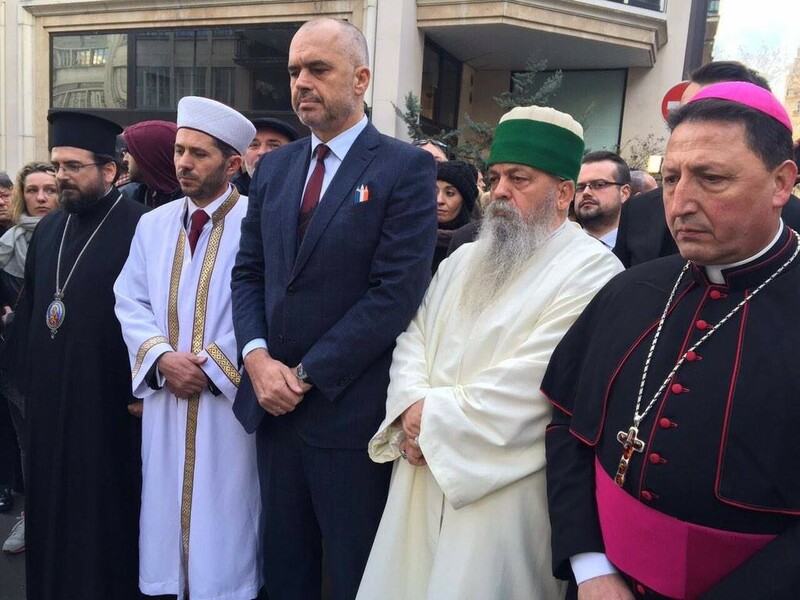 PM Edi Rama surrounded by Orthodox, Muslim, Bektashi, and Catholic leaders at the commemoration of the Charlie Hebdo massacre, Jan. 12, 2015. As many former Eastern Block countries in the EU display a hardly dissimulated form of racism and religious hatred, Albania, always a little behind with the most recent fad in international politics (we’re still doing New Labor here), has been profiling itself as a country of multicultural and multireligious tolerance. Ostentatious display of this sympathetic ideal started with Rama showing up at the orchestrated Charlie Hebdo media event “politicians truthfully mourning in public” surrounded by religious leaders of the four main Albanian religions, and was continued last week by hosting the large-scale ecumenic “Prayer of Peace” event, commemorating the 20th anniversary of the end of the Balkan wars (if we ignore the Kosovo war, that is). Closing Ceremony of “Peace Is Always Possible,” the 2015 ecumenic “Prayer of Peace” event, Sept. 8, 2015. 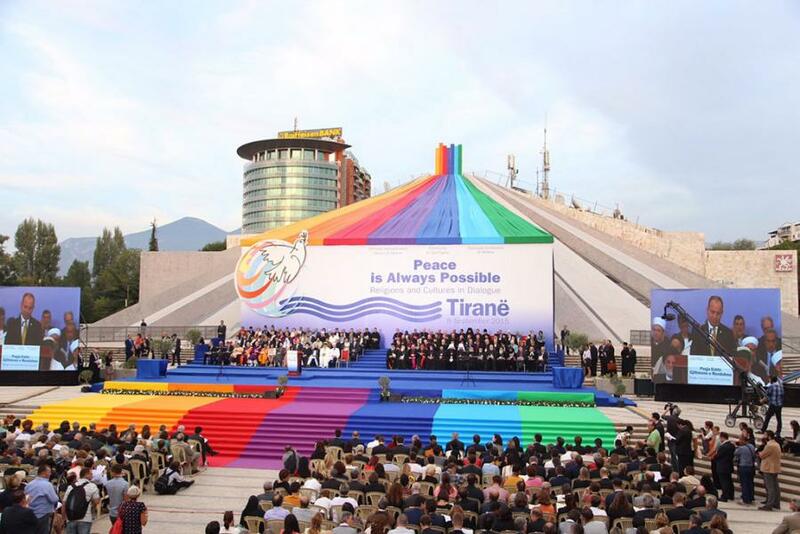 While the recently “restored” former mausoleum of dictator Enver Hoxha was adorned with a fabulously giant rainbow banner (in fact the LGBT community has asked for the banner to be donated after the event to be used at the 2016 Pride event), all speakers urged their respective deities to support “peace” – of whichever kind, one imagines –, little did they know the efficacy of their prayers and acclamations, namely that just a few hundred meters away the Latin adage si vis pacem para bellum (if you want peace prepare for war) had let to immediate consequences in Tirana public space. I have long resisted referring to the many bunkers that are a remainder of Hoxha’s totalitarian regime and paranoia in the Albanian landscape. They have been endless photographed by tourists and documented in different art projects (here, here, and here), integrated in Ardian Isufi and Fatos Lubonja’s Postbllok monument, ironically commented on in Carsten Höller’s Triple Mushroom, and politically commodified in the pathetic and historically inaccurate exposé (and, again, indefinitely closed), Bunk’Art. 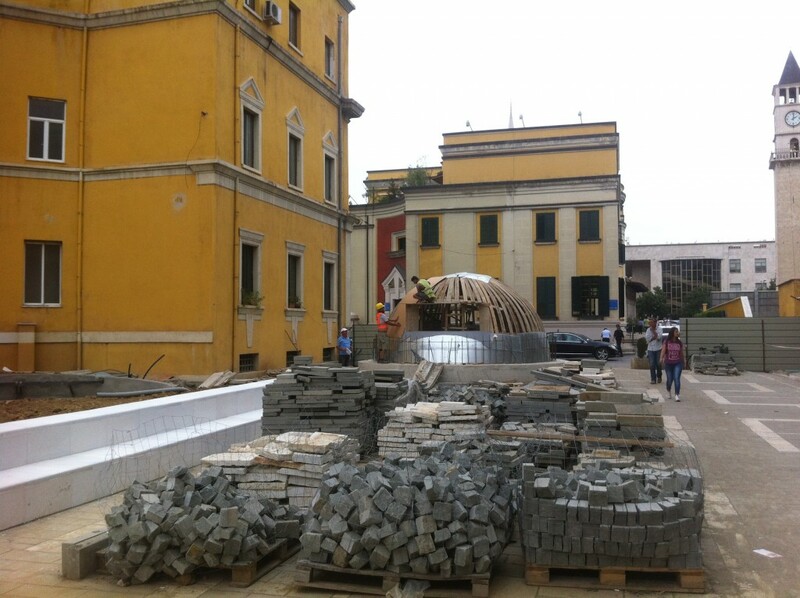 But when I passed a few days ago in front of the National Theater, I was stunned to find a group of workers actually constructing a bunker in the center of the city. There it was: a large, concrete bunker built over what is assumed to be the entrance to the large underground atomic bunker underneath Skënderbeg square. 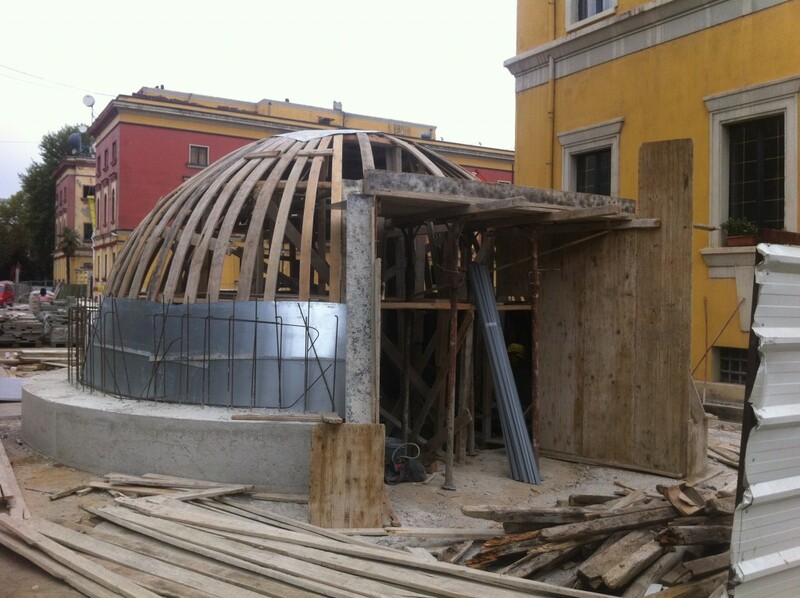 Bunker under construction behind the Ministry of Transport and Infrastructure, Sept. 11, 2015. In spite of the fact that this is the first “mushroom” bunker constructed in Albania in more than 25 years, hardly anyone – at least in the media – seemed to blink an eye. Again: this is not an ironic bunker, not a bunker “reenactment,” “appropriation,” or “citation.” It is precisely what it is, a bunker in the middle of the city. Just like some freelance designer somewhere must have thought that it was appropriate to refer to the former interrogation headquarters of the security services with the metaphor of the “sleeping beauty” to be “kissed awake,” some unidentified architect thought it was a neat idea to deface an otherwise nice and not even completely finished public square with an enormous, decontextualized piece of military architecture. And it should definitely be a question whether a government should be allowed to make these types of interventions in public space, outside the knowledge or approval of the local municipality, at a few meters from several cultural monuments, and through a seemingly unknown “decree” of the Council of Ministers. If this is how public space is organized – dictated, almost –, we are really not far removed from forms of politics that recently seem to gain traction all over the region. Perhaps the Albanian government will catch up, after all. I have noticed with concern, a concern that I feel is turning into chagrin, that we are slowly but unstoppably acquiring the features of an arrogant government in our behavior with each other; of a government of people that are capitulating to the easiness of responding to these difficulties by expressing this capitulation in its primary form, which its ARROGANCE, inattention, idleness, nervousness, and the free flow of the relations with the OTHER; of a government that fatally acquires the wog [turkoshak – a racial slur] trait in its behavior of its own people with the representatives that you are, each of you! Arrogant with each other in all forms of expression of this feature that is corrosive for the government. Arrogant with members of parliament who are who they are, the irreplaceable base on which we build our daily work and realize short-term, mid-term, and long-term objectives! The reflection of this arrogance is unfortunately felt in the relation with duty, a duty that is not done with passion and persistence in the early hours, but ever more with the comfort [rehatllëkun – an Ottoman loan] of the Turkish late-afternoon hour, a type of suffocating heat where comforting snores are starting to be heard under the buzzing of flies. The reflection of this arrogance is felt in the ever more wog [turkoshak] relation to time, where the insomniac stress of the beginning has given way to the exhausting apathy of tiredness from futilities, lunches, dinners, chatting, and, God save us, attention paid to minor interests. But worst of the worst, this arrogance acquires shameful traits beneath you, along the lines of the pyramid where the base of the Ottoman occupation of arrogance of the small power of small people upon each other goes, broadening indiscriminately. Have you ever been overcome by the question what happens in the other offices of the ministries where you enter and are meeting those 3–4 people that except your presence are not the leadership but the most powerful generator of arrogance and blind idiocy of complacency from being the trusted people of the minister? And what about the question what happens further, in the buildings outside the stomach of the building of your power, where the meanness in manner and all-encompassing erosion of our government continues day by day, each hour, in each working relation and over each task to be done and to reported? For sure each of you says to him or herself what does he have with me that he put me in the recipient of this message(? ), but before you find yourself in those lines try to find the essence of this most serious concern that affects the image, behavior, and performance of our team. Because I don’t see any of you like as much as an individual rather than each of you as a player of a team that I have chosen to change Albania, beginning with the change in the culture of leadership, of the behavior of leadership, of the seriousness for the “small” things which in fact or the founding stones for the big ones! I do not expect an answer, but a deep reflection through a radical change in behavior and a clean-up, as soon as possible, of the mirror in which day after day the profile of our government is deformed as the result of sinking in the swamp of stupid self-sufficiency that drowns governments from the inside; from inside the heart of each minister; from inside the brain of each participant of this directionless team; from inside the cabinets of the institutions that suffer under the weight of the water injected in the heart and brain! Take this message as an SOS and not as a depletion of my patience by one or another reason that remained unsaid above, because those, I assure, don’t exist. This government has only one enemy and this enemy is the Turk that lives within each of you, either drown or prepare to leave the ship!! PS2: I am not sure whether the pertinent minister or bureaucrat was drowning or leaving the ship, but the minor negative feedback from the media and population to the bunker “idea” definitely motivated him/her/them to surround the work site with a metal fence, pull a Christo, and cover the bunker with a white, rather theatrical, sheet. Are we witnessing here – perhaps – the private burial of the bunker, or otherwise the appearance of a phantom-bunker from the past haunting the militarized present?